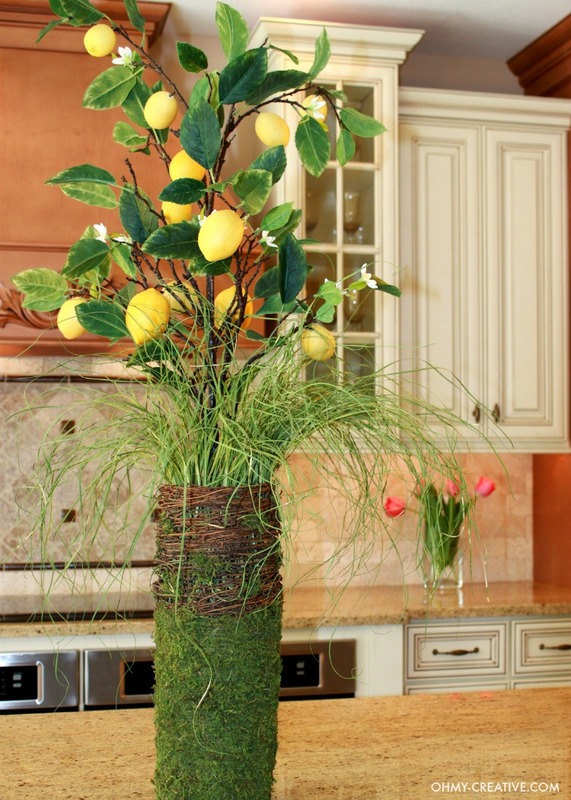 This is an Easy Spring Lemon Centerpiece anyone can put together. I always feel like I need something tall on my kitchen island – to fill the space. What I really love is fresh flowers, but that can get a little expensive. I do try to grow a lot of flowers in my yard just for the purpose of cutting and having fresh flowers in my home. 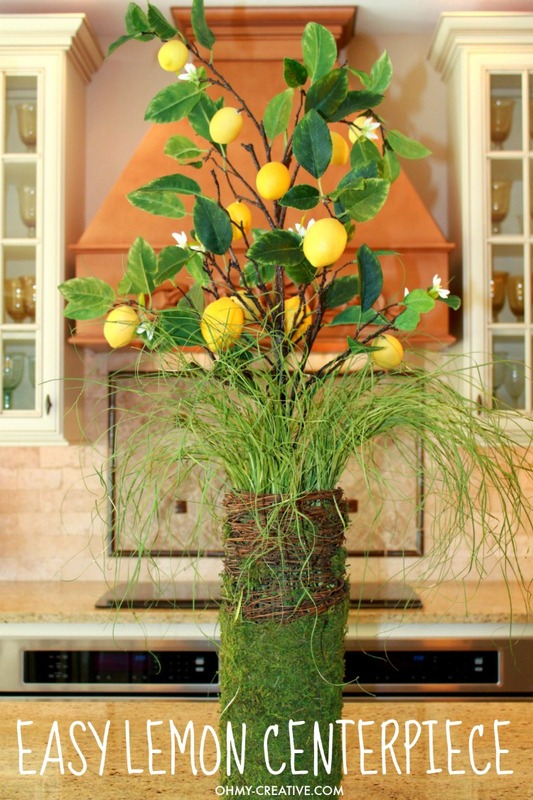 So, I Put this lemon centerpiece together in just a few minutes and really love how it turned out. I have to admit that I owned most of items to make this, but it would be easy to find something to substitute. 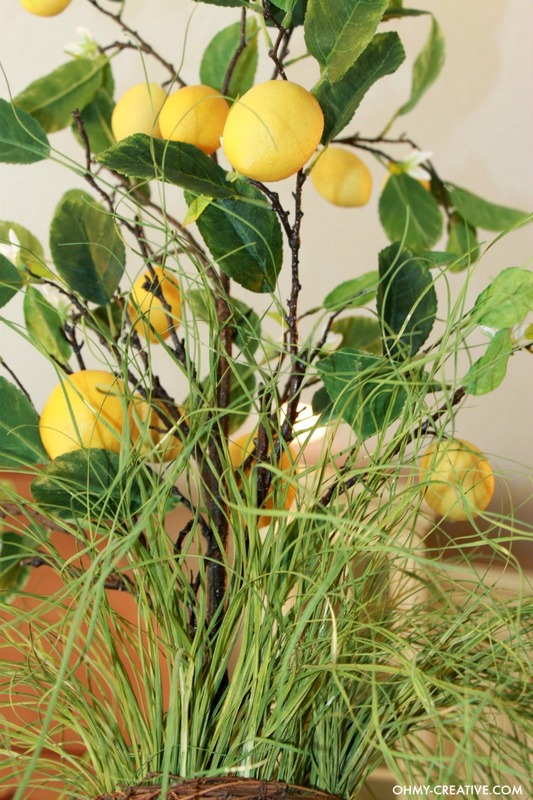 The one thing you can buy now is the Faux Lemon Branch – I bought these at Pier 1 Imports . I used two branches and they look great. You are not going to find this exact moss cylinder but you could possibly make something using this Moss Roll or Moss Mat Peel and Stick . I have used the Moss Mat on several project like this Spring Frame Decor and it is easy to work with! The green willowy grass is a few years old from Pottery Barn as well as this moss and twig cylinder. I am sure at most craft stores you can find something to replace these items. The lemon branches are heavy. I placed floral foam in the bottom of a tall glass vase and stuck the stems down in the center. This held them in place so they couldn’t fall over. 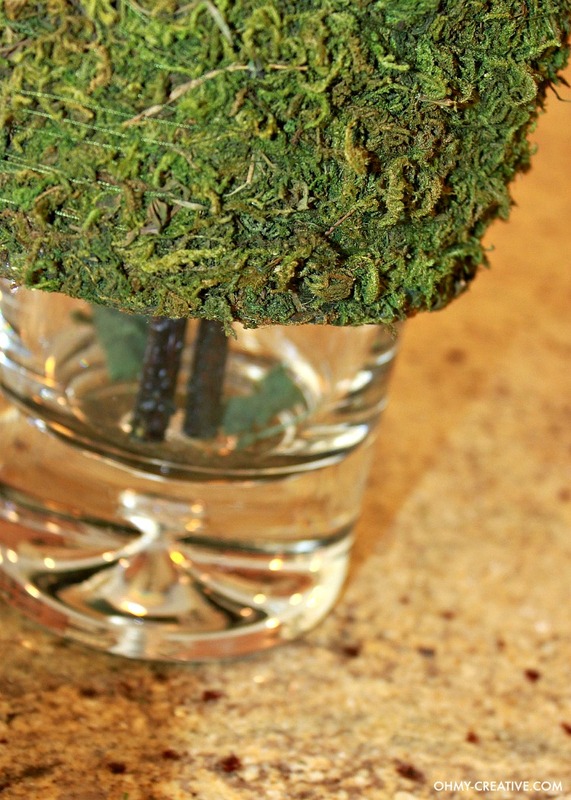 NOTE: My glass vase has a thick heave glass bottom to help hold the branches and the vase from tipping over. Find more inspiring SPRING and HOME DECOR here for your home! What a great centerpiece, I love how it turned out, amazing what you can do with moss, I have seen several other projects this week I want to try. This is SO gorgeous!! It’s bright and cheery!!! Love it! Thank you so much, Katelyn! I love the fresh bright look as well after a long winter! That’s so cute, but I hafta say that I HAVE to stay out of pier 1 – my gosh I can hardly stop myself once I get going there! And even worse, I’m always buying one of this or two of those for my blog. My daughter is going to kill me after I die and she has to go through it all, lol!! Thanks for linking up with us on Throwback Thursday!